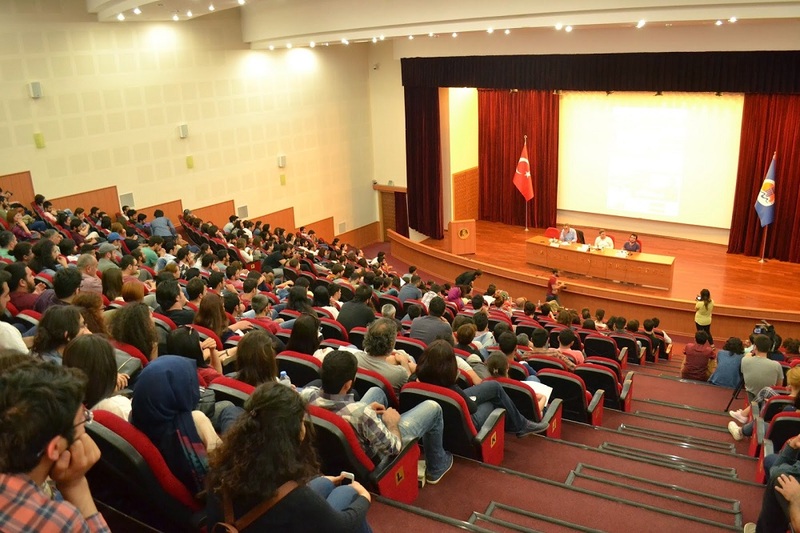 A significant number of students and professors participated in the panel, which started at Uğur Oral Cultural Center at 1:30pm. Canfida Çakırbay, on behalf of Avam Fanzin, and İsa Uğur Erdoğan, on behalf of Alternatif [a print-only magazine by Mersin University School of Communication students], gave brief speeches prior to the panel, which was sponsored by Mersin University Cinema Society, Avam Fanzin, Magazine Alternatif, Mersin University Eğitim-Sen Office, and Mersin 7 Colors LGBTI Foundation. The panel was then held under the moderatorship of Dr. Filiz Bilgin Ülken. İsmail Yılmaz, who gave a lecture on the Hrant Dink assassination and the Zirve Publishing House massacre, stated that these two assassinations were implemented with the knowledge and collusion of the Justice and Development Party [AKP, the current ruling party in Turkey], the Gülen sect [an ultra-religious sect that is now in competition with AKP for political and financial power], Turkey’s National Intelligence Agency [MIT], the Gendarmerie, the Office of the Police Commissioner, and the Appellate Court. Stating that Hrant Dink was accused of being an “enemy of the Turks” through media headlines and publications, Saymaz added that these were examples of hate speech. Yıldız Tar, a journalist, reporter, and Kaos GL’s editor, lectured on hate crimes in relation to sexual orientation and gender identity. Tar stated that a similar example was experienced in Avcılar [a neighborhood in Istanbul], where Tar arrived to report on the events and encountered a shocking scene. Hailed by many as the symbol of and instrumental in the militarized construction of early Turkish womanhood, Sabiha Gökçen is not only the stepdaughter of Atatürk, the founder of the Republic of Turkey, but also the first woman fighter pilot in Turkey who additionally participated in the air raids of the 1937-38 Dersim Massacre against Kurds. On February 6, 2004, Hrant Dink published an interview, titled “The Secret of Sabiha Hatun” [“Sabiha Hatun’un Sırrı”], in the Agos newspaper. In this interview, Hripsime Sebilciyan claimed that she was Sabiha Gökçen’s niece and that Gökçen was in fact an Armenian orphan, a claim that had the potential to shatter the Turkish national identity project at its threads. For more information on the events that followed, see also “Anti- Campaigns and Court Cases” in Hrant Dink’s Biography. –Trans. The Grey Wolves, “Ülkü Ocakları,” is a neo-fascist youth organization with formal ties to the Nationalist Movement Party (MHP). Established in 1960s, the organization operated as a death squad during the civil turmoil and perpetrator of numerous massacres leading to the 1980 military coup. It was later uncovered that it was used as part of a counter-guerilla force by the Turkish government against leftists and minorities during the Cold War era, as part of the Turkish branch of NATO’s Gladio. –Trans. On 18 April 2007, a number of assailants with alleged links to and support from a clandestine fascist sect of the Turkish gendarmerie, military, and security forces (also see here), tortured and murdered three Protestant employees of Zirve Publishing House in Malatya. –Trans. ← Whoever criticizes Erdogan finds themselves in court; Here are the court cases!